Where to Stay in Universal Studios Singapore? The following 13 Universal Studios Singapore tour tips will be of great help to anyone who has a plan to visit the theme park during his or her trip to Singapore. If you are new to Universal Studios, I would suggest that you take an overview of the seven themed zones first: Hollywood, New York, Sci-Fi City, Ancient Egypt, The Lost World, Far Far Away and Madagascar. Then have a feel of what the theme park looks like by browsing through some of the Photos of Universal Studios Singapore. The very first and most valuable tip for your Universal Studios Singapore tour is to book your tickets in advance through Resort World Sentosa official website. It will save you time and avoid the disappointment of tickets being sold out in last minute purchase, especially if the date falls on public or school holidays. Click on the 'Excitement and Adventures'. Click on the 'BOOK TICKETS' button. Click on the 'Select' button of your choice then click on the 'Select Date' button to pick your date of visit. If the payment process go through successfully, you will soon receive an email from Resorts World Sentosa with attachment of a booking confirmation letter and an e-ticket. Buy the following three tickets: Universal Studios, Two Ways Cable Car and any one of the following three attractions: Luge and Skyride, 4D Adventure Land 4 choose 1 or Wings of Time at a discounted price of just S$108 per adult or S$81 per child. Universal Studios, Two Ways Cable Car and one of the below three attractions for S$108/Adult or S$81/Child. Please fill up the above request form and we will reply you by the next working day. In our email, you will find all the information you needed to know on collection of tickets and making payment for the deal. Finally, remember to click on the 'Submit' button to send your request to us. For adult, the roller coaster Battlestar Galactica in Sci-Fi City is a thrilling and challenging ride not to be missed. The other exciting ride is the indoor roller coaster Revenge of the Mummy in Ancient Egypt zone. The Lost World has two fun rides that are good for the whole family, the Jurassic Park Rapids Adventure and Canopy Flyer. The Waterworld zone has an interesting live show with lots of stunts and explosions. If you enjoy live performance, the new musical Broadway Show Monstrocity at Pantages Hollywood Theater is entertaining. As for children, don't miss out the following show: The Lights, Camera and Action, Donkey Live and Shrek 4-D Adventure. Rides suitable for kids include Treasure Hunter, Dino-Soarin', Canopy Flyer, Magic Potion Spin, Enchanted Airways and King Julien's Beach Party-Go-Round. Take note that the above timing may change at any time without prior notice. USS Tour Tip 4: Do you need an express pass? if you intend to ride or see most of the attractions in the theme park in a day. the day of your visit falls on weekend or public holiday or school holidays. You may decide to buy the pass at a later time at some of the appointed retail shops counter in the theme park if you found out that the park was too crowded. With an Express Pass, you still have to queue among those with these passes, however, the queues are generally not too long. In my experience, on average it took 2 to 10 minutes to queue for a ride on a public holiday. USS Tour Tip 5: Which rides to go first? Canopy Flyer and Jurassic Park Rapids Adventure in The Lost World zone can wipe out 2-3 hours of your valuable time just for the purpose of queueing in peak season. Even the Express Pass holders have to wait for 30 to 45 minutes. So give priority to take these rides first before noon as the queue waiting time for most rides between 10am to 12pm are shorter. If you happen to be there on Saturday, you may want to extend your stay till evening for the Lake Hollywood Spectacular fireworks show at 8pm. Another not to miss show is the Hollywood Dream Parade which is schedule on Saturday and Sunday at 5pm. To make full use of your time, you should avoid visiting the park on weekends and public holidays as the queue at most rides and attractions will be longer. If possible, avoid school holidays as well. Singapore primary and secondary school holidays for 2019 are as follow: 16 to 24 Mar, 1 to 30 Jun, 7 to 15 Sep and 16 Nov to 31 Dec.
* As the public holiday fall on a Sunday, the following Monday will be a public holiday. * Hand-held infants are not permitted. Few of the rides and shows like Jurassic Park Rapids Adventure, Waterworld and Shrek 4-D Adventure may get you wet. So either prepare to wear a raincoat or bring a spare clothing. The raincoat is especially useful when it's raining as you still can move around the park without getting wet. There are many water coolers around the park, so you may not have to bring lots of water as you can replenish it at any time. As for food, try out some Local Food at Discovery Center Food Court located at the Jurassive Park. However, avoid lunch hours from 12 to 2pm as the queue will be long. Singapore weather is hot and humid. So wear light clothing and bring umbrella with you to keep cool. How to get to the Universal Studios Singapore? You may get there by public buses, MRT train, Sentosa Express, private car or Taxi. Find out the easiest way to get to Universal Studios Singapore. 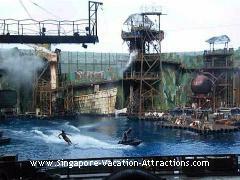 USS Tour Tip 13: Where to stay for your Universal Studios Singapore tour? There are six hotels, namely Hard Rock Hotel, Hotel Michael, Festive Hotel, Crockfords Tower, Beach Villas and Equarius Hotel in Resorts World Sentosa Integrated Resort which are just a stone throw away from Universal Studios Singapore. Watch a Video of the Hotels in Resorts World Sentosa IR. You may Book the Hotels Online at Resorts World Sentosa website.